Dr. Sultan is an Assistant Professor at the Department of Petroleum Engineering. His research group focuses on complex and reactive fluids to address problems in the oil and gas industry related to enhanced recovery, drilling fluids, stimulation, and scale prevention. He established Complex and Reactive Fluids (CRF) Lab at KFUPM. Dr. Sultan authored a number of papers on polymeric membranes and smart fluids, acid stimulation, gels, and emulsions. 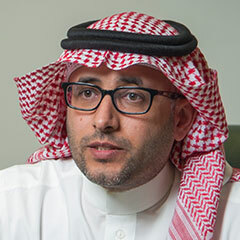 He was appointed as Director of the Center of Petroleum & Minerals, Research Institute, KFUPM (2010 – 2015), and Chairman of the Department of Petroleum Engineering (2012 – 2017). Ph.D., Petroleum Engineering, Texas A&M University, USA, 2009. M.S., Chemical Engineering, KFUPM, KSA. 2004. B.S., Chemical Engineering, KFUPM, KSA, 2002. Complex and Reactive Fluids for oil and gas applications. Abdullah S. Sultan, Jimoh K. Adewole, Amir Al-Ahmed, Mazen Nazal, S. M. Javaid Zaidi. (2017). “Preparation and Performance Evaluation of SPEEK/Polyaniline Composite Membrane for Direct Methanol Fuel Cell, International Polymer Processing”. DOI: 10.3139/217.3259. Amir Al-Ahmed, Mazen Khaled Nazal, Abdullah S. Sultan, Jimoh K. Adewole, Syed Javaid Zaid. (2016). “Proton conducting blend membranes: physical, morphological and electronic properties, Polymer Bulletin”. (Accepted). DOI:10.1007/s00289-016-1756-6. Mohamed E. Kandil, Nayef M. Al-Saifi, Abdullah S. Sultan. (2016). “Simulation and measurements of volumetric and phase behavior of carbon dioxide + higher alkanes at high pressure: CO2 + n-decane at temperatures (313–410) K and pressures up to 76 MPa”. International Journal of Greenhouse Gas Control. 53, pp 198–206. DOI: 10.1016/j.ijggc.2016.07.045. Muhammad Shahzad Kamal, S. M. Shakil and Abdullah Sultan* (2016). Development of Novel Amidosulfobetaine Surfactant–Polymer Systems for EOR Applications. Journal of Surfactants and Detergents. Vol. 19, pp 989–997, DOI: 10.1007/s11743-016-1848-1. S.M. Shakil Hussain, Mustapha Alao Animashaun, Muhammad Shahzad Kamal, Nisar Ullah, Ibnelwaleed A. Hussein and Abdullah S. Sultan* (2016). Synthesis, Characterization and Surface Properties of Amidosulfobetaine Surfactants Bearing Odd-Number Hydrophobic Tail. Journal of Surfactants and Detergents. Vol.19, pp 413–420. DOI: 10.1007/s11743-016-1788-9. Muhammad Shahzad Kamalal, Ibnelwaleed A. Hussein, Abdullah S. Sultan and Nicolas von Solms (2016). Application of various water soluble polymers in gas hydrate inhibition. Renewable & Sustainable Energy Reviews. Vol 60, pp 206-225. DOI: 1016/j.rser.2016.01.092. Adel O. Al-Amodi, Usamah A. Al-Mubaiyedh, Abdullah S. Sultan, Muhammad Shahzad Kamal, Ibnelwaleed A. Hussein (2016). Novel Fluorinated Surfactants for Enhanced Oil Recovery in Carbonate Reservoirs”. The Canadian Journal of Chemical Engineering. Vol 94 (3), pp 454-460. Abdelhalim I. A Mohamed, Ibnelwaleed A. Hussein, Abdullah S. Sultan*, Khalid S. M. El-Karsan, Ghaithan A. Al-Muntasheri (2015). DSC investigation of the gelation kinetics of emulsified PAM/PEI system. Journal of Thermal Analysis and Calorimetry. Vol 122(3), pp 1117-1123. DOI: 10.1007/s10973-015-4965-6. Muhammad Shahzad Kamal, Abdullah S. Sultan, Usamah A. Al-Mubaiyedh and Ibnelwaleed A. Hussein (2015), “Review on Polymer Flooding: Rheology, Adsorption, Stability and Field Applications of Various Polymer Systems”. Polymer Review Vol. 55 (3). DOI: 10.1080/15583724.2014.982821. A.L. Ahmad, J.K. Adewole, C.P. Leo, S. Ismail, A.S. Sultan, S.O. Olatunji (2015), Prediction of plasticization pressure of polymeric membranes for CO2 removal from natural gas. Journal of Membrane Sciences 480, 39-46. J.K. Adewole, A. S. Sultan (2014), A Study on Processing and Chemical Composition of Date Pit Powder for Application in Enhanced Oil Recovery, Defect and Diffusion Forum Vol. 353, pp 79-83.